OIT measurements enable characterization of the long-term stability of hydrocarbons such as fats and oils as well as plastics such as polyolefins, especially polyethylene and polypropylene. The oxidative stability can be determined by using Differential Scanning Calorimetry (DSC) in standardized test methods. The OIT tests can be easily performed and provide useful stability data. 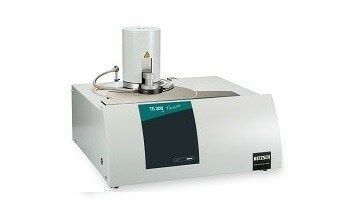 Moreover, they can help predict the thermo-oxidative performance of materials and achieve failure prevention. DSC systems used for OIT determination include the DSC 404 F1/F3 Pegasus, DSC 200 F3 Maia and DSC 204 F1 Phoenix from Netzsch. In this test, the oxidative stability of two highly heat-resistant polypropylene samples from different producers is determined. Here, there is only a very small difference in the melting behavior of the two materials. However, the OIT test is able to clearly show the difference between the samples. The oxidative stability of the sample from Producer A is identified at 15 min. On the other hand, the sample from Producer B exhibits a very high stability and deterioration begins after 122 min, as shown in Figure 2. Here again, the melting behavior of two PE-HD samples differing in grade is nearly identical, as shown in Figure 3. However, the OIT test is able to clearly show the difference between the samples. The oxidative stability of Sample Grade 1 is determined at 43 min, while that of Sample Grade 2 is much lower, as shown in Figure 4. This example clearly shows that it is possible to acquire in-depth data from DSC curves by simply changing the temperature program. This test involved the analysis of materials PE-HD, PE-RT Type 1 and PE-RT Type 2, each as an aged tube, an extruded tube and a granulate. All underwent a temperature change treatment and their melting behavior and behavior in an oxidizing atmosphere are illustrated in Figures 5, 6, 7 and 8. If the samples to be investigated vary greatly with their resistance to oxygen, then comparison at an identical isothermal temperature will not be possible. An alternative temperature program depicted in Figure 9 ensures that the samples are completely molten and allowing for a change of atmosphere at a temperature at which point most reactive sample does not react instantly subsequent to the gas change. The melting and oxidation behavior of PE-RT Type 2 samples are shown in Figures 10 and 11. It is not possible to select the isothermal temperature below 180 °C as the melting point of one component is roughly 180 °C. Hence, a dynamic temperature program can be used to significantly differentiate between strongly varying oxidation behaviors. As outlined in ASTM E2009-08, the OOT is a relative measure of the level of oxidative stability of a material analyzed at a specified heating rate and oxidative environment. This test method may be useful in the determination of the presence or efficacy of antioxidants. In this example, DSC measurements were performed on two TPE parts (poor and good) and the results are illustrated in Figures 12 and 13. During the first heating, the good (blue curve) and poor sample (green curve) exhibited the identical thermal behavior. Nevertheless, subsequent to the environment change with increasing temperature, the DSC curves showed variations which can be observed from the deviating oxidation behavior of the two samples. The OOT of the good part took place above 241 °C, while that of the poor sample was 229 °C. Standard aluminum or open copper crucible can be used to determine the OIT as outlined in ASTM D3895. The OIT measurements on HDPE performed in an open copper (red) and aluminum (black) crucible, respectively, are depicted in Figure 14. From the results, it is evident that the onset of HDPE oxidation under isothermal conditions is 23 min earlier in the copper crucible when compared to the aluminum crucible. Moreover, the bottom of these crucibles can be shaped using the stamping tool kit of the sealing press as shown in Figure 15. These crucibles are specially designed to determine the OIT of lubricants and grease as outlined in ASTM D5483-5.